That someone is usually me, which makes meal time prep difficult. I’ve tried a basket of toys in the kitchen, but he still takes off for the stairs, or out the front door, when a brother accidentally leaves it open. Sigh. I’ve tried having him have a small snack while I’m chopping, loading, preparing…but then he isn’t good and hungry when it’s time to eat. So I’ve resorted to prepping things while he’s napping, in the hopes that dinner prep is easier and goes as smoothly as possible. And in the case of this meal, it couldn’t have been easier. Already cooked and shredded chicken, tossed in with sauteeing peppers and onions, placed onto a bed of tortilla chips, topped with cheese, or sour cream, or salsa, or guacamole. Or all of the above. Pre-grilled chicken would work too! Thaw the pre-cooked and shredded chicken, or grilled chicken. If need be, saute 2 chicken breasts in oil until cooked through, then slice. In a large skillet, heat the oil and then toss in the sliced peppers and onion. Saute for 4 to 6 minutes, or until onions begin to turn opaque. Add in the chicken with the taco seasoning and saute together for a few minutes. Remove from heat. To serve, place tortilla chips on the plate or bowl, top with the chicken-pepper mixture, then add a pinchful of shredded cheese. Serve Chicken Fajita Nachos with sides of guacamole, or salsa, or sour cream with side of fresh fruit or veggies. These look fantastic – and easy! 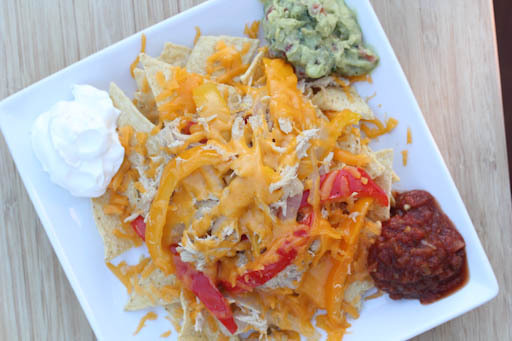 I like to make nachos for dinner when we have leftovers that can be thrown on top…nothing easier! i made this after a REALLY long baseball tournament day. perfect blend of comfort food, fast and of course, economical 🙂 a win!